It is not only the extreme temperatures that make life difficult for measuring instruments when they are being used at sea or measuring liquefied gases. Petrochemical products are characterized by their low dielectric constants and are generally difficult to measure. 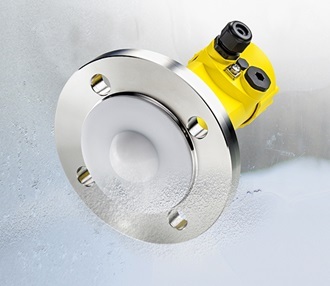 Because they are temperature decoupled from the process, the 80-GHz radar sensors from VEGA are optimized for the extreme process temperatures that prevail in LNG applications: they easily withstand temperatures as low as -196° C.
Ice does not form on the housing, nor is there any condensation on the antenna system. In addition to cryogenic applications, the specially protected housing and front-flush antenna cover of PTFE are also suitable for reliable measurement of aggressive media, whether acids, alkalis or abrasive substances. From the top of the housing to the business end of the measuring cell, the sensor is extremely robust and equipped with high-quality components. The key element is its highly resistant stainless steel housing, which thermally decouples the sensitive electronics inside.